It’s that ripple-covered lobe on the bottom right. 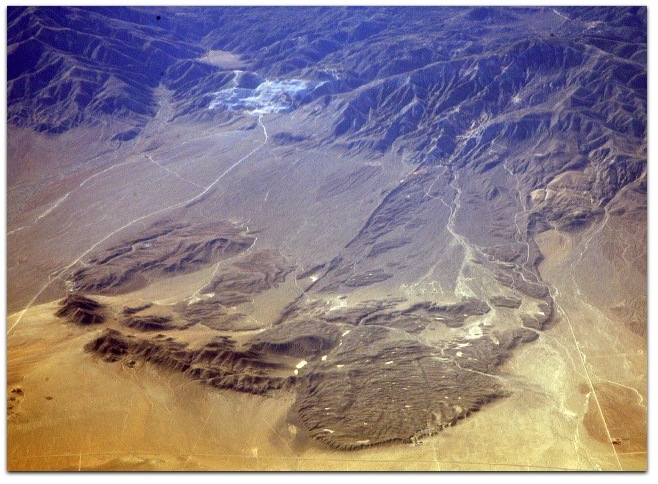 According to Robert Sharp’s Geology Underfoot in Southern California, it didn’t just flow off the mountain, as would happen with a typical landslide. It actually slid intact, like a toboggan, four and a half miles, on a slope of only two to three degrees. It could not have traveled so far, and have remained so intact (with rock layers preserved, in order, top to bottom), if it had merely flowed. Geologists can tell it slid because it didn’t just heap at the base of the mountain from which it detached. Instead it soared, at low altitude, four and a half miles, on the flat, on a cushion of air, out across the desert, before plopping down. To get some perspective on this, here are two facts to consider. First, we’re talking about ten billion cubic feet of detached mountain face here. Second, in order to travel that far out onto the desert, shattered but essentially in one piece, it had to glide on a cushion of air, at speeds up to 270 miles per hour. Or so goes the theory. One wonders if humans were there to see it happen. Ancestors of native Americans were already on the continent by then, thanks to the last glacial maximum, which still had several thousand more years to go. There may have been some ice on the mountains themselves, and perhaps that helped weaken the rock, which was already raised to the sky by pressures on the San Andreas Fault, which lies on the back side of the San Bernardino Mountains, a couple dozen miles from here. I came along a bit late, but was glad to get my first chance to gander at the slide, the day after Thanksgiving, on a United flight from San Jose to Houston. I was shooting against the sun, and it was a bit hazy, but I was still able to get a good look, and this photo set too. Thanks, Stephen. Interesting to observe the similarities. Here’s the Wikipedia article on the Frank Slide. At 270 MPH on a cushion of air? Air Hockey of the Gods. A cushion of air is preposterous. There are other explanations but the high priests of science generally command the prevailing explanation no matter how ridiculous. One only need look at the surrounding environment to see it couldn’t have happened in just that spot in just that way. Great post. Geology rocks. Ahem. Thanks for the compliment, Charles. FWIW, I believe the main work done on the slide is by Ron Shreve, who advocates the air cushion hypothesis, and by others who advocate a theory involving high frequency sound fluidizing fine particles at the base of the slide. From what I can tell with a quick look around the Web and in my only book on the subject, most of the theoretical work was done quite a while ago. (Shreve’s was in the ’60s.) I’m also not sure anybody who has studied the slide is a “high priest.” They’re just geologists trying to make sense of a mountain face that slid in a remarkably coherent form almost five miles across a nearly flat surface. Fascinating! Southern California is a very unique place geologically speaking, they are many geological wonders in the desserts of Southern California. Not far from where you took this picture; off of the Mojave Road there are also lava tubes or chambers carved out of rock by lava from a now extinct volcano. California is also home to Mount Whitney (at an elevation of elevation of 14,505 feet) it is the highest point in the United States and Death Valley, CA is the lowest point of elevation in North America at 86 miles below sea level.